Viking Yacht Service Center has recently expanded its facilities and is seeking to expand its teams! VYSC provides opportunities for employees to demonstrate their talents, challenge their technical skills or gain and expand their knowledge in the Marine trade industry by performing or learning to complete repairs, refits and upgrades, from basic to custom fabrication, contributing to Vikings vision to continue as a world leader in the marine industry. 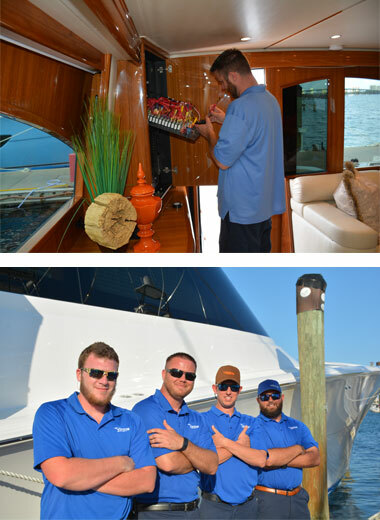 Along with competitive pay and excellent benefits, our employees enjoy a safe, positive work environment and optimal work hours of 7am – 3:30pm, Mon – Fri.
Viking Yacht Company FLORIDA is always seeking outstanding people to join our Viking Yacht Service Center team.